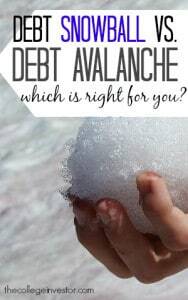 Home » Snowball vs. Avalanche: What Is the Best Debt Payoff Method? When you first start paying off debt, the most important thing is to have a plan. Without a plan, paying off debt can seem like a daunting task, which will quickly deflate any motivation you have to, you know, actually pay off debt. Having a plan can help you realize that debt is not forever, and that it is possible to be debt free. So often, debt feels like a lifetime sentence, but it doesn’t have to be. The snowball method, which is revered by personal finance guru Dave Ramsey, focuses on your smallest balance first. So if you have credit cards, student loans and a car loan, the first step would be to list out all of your remaining balances. Which one is the smallest? Focus on that one first. The point is to pay the minimum on the rest of the loans, while you aggressively attack the smallest balances. After that one is paid off, you move to the next smallest, and so on and so forth. The theory behind this methodology is that it allows for quick wins, which can help motivate you on your path to debt freedom. Half the battle of paying off debt is the motivation to do so, so this method is great if you are looking for an extra boost of motivation. The cons? You are likely to pay more in interest over time using this method. On the other side of the spectrum, you have the avalanche method, which focuses on the highest interest rate first. I personally use the avalanche method, as my balance on my high interest debt is much larger, effectively stealing a few hundred dollars from me each month. In comparison, my undergraduate loan has a smaller balance and bearable interest rate of 2.3%. What I like about the avalanche method is that I am mathematically making a difference in my debt — and I can see that my interest payments are getting lower. Yes, I don’t necessarily get the quick wins feeling of the snowball method, but I know that I am wasting less money on interest, which is very important to me. The avalanche method will have you paying less money over the life of your loan and focuses on the mathematical principles of paying off debt, rather than the psychological ones. In personal finance, nearly everyone has an opinion on what debt payoff method is best — yet, it’s largely swayed towards the snowball method. And I get it, too. It makes sense. However, I personally believe in the benefits of the avalanche method. But ultimately, what I think is best for you isn’t necessarily one of these two options. I think it’s whatever helps you sleep best at night. That may sound weird, but debt can do a number on your money mindset, your motivation, and your self-esteem. It’s okay to change things up a bit. You can create a hybrid method of paying off some small balances, then focusing on bigger payments. You can save a bunch of money and then make one lump payment. Do what makes sense for you, but whatever you do, the most important thing is to get started. It can be easy to get into analysis paralysis and thinking that you have to choose a plan and feel threatened by doing things the “right” way. Do it your way, but just do it. Momentum leads to motivation and can keep you going, so one day you too will be debt free — and I can’t wait to see you there! What method do you use to pay off debt? Honestly, there is no one ‘best’ answer that fits everybody. It really depends on the individual and their situation. Two people side by side may have completely different answers about what is ‘best’ and there is nothing wrong with that. In reality, the ‘best’ is that you are concentrating on eliminating debt. How you get there is secondary, in my opinion. I totally agree — I think it’s nice to have a plan, but action is the most important part. If you’re disciplined and unemotional about money, then paying the highest interest balance first makes the most sense–obviously. But, because we live in a world where money and emotions are intricately linked to one another, I would recommend to most people (and all strangers) to tackle that lowest balance first in order to stay motivated. It’s funny. I’m super emotional about money, but I have to do the avalanche. But I understand where you are coming from. The cheap ! @#$% in me says Avalanche, but the constant desire for instant gratification says Snowball. In this case, since either is a win, I choose the Snowball method – simply because I see progress quicker. For the majority of folks the snowball makes more sense because it allows the debtor to “grab a foothold” and get some momentum going. There are always exceptions, but I’d bet in the majority of cases the lost interest (by not going Avalanche) would be minimal compared to the potential for wearying prematurely. It seem like people are generally able to knock out their smaller debts pretty quickly and are usually left with clearing their student loans. I like the concept of the avalanche better, but the snowball makes a lot of sense too. If I have to buy appliace without planning and in emergency situation, I always buy on my store card, and the interest free promotion lasts for about a year. I have never paid interest on appliances. You have to make sure you pay off before the promo expires. The snowball works for most people because if your budget cannot stretch too much, you can shift the minimum payment to the small balance that you paid off towards the other bill you still have, otherwise you would keep dragging seceral diffent cards for longer period of time, paying interest in all if them.